The gentlemen down at The Albany Distilling Company have done it again. On March 23rd Matt and John released a new product to their already wildly successful line of spirits. 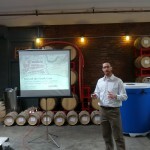 Quackenbush Still House Rum’s debut was announced by being accompanied with a presentation on rum and it’s history in Albany. 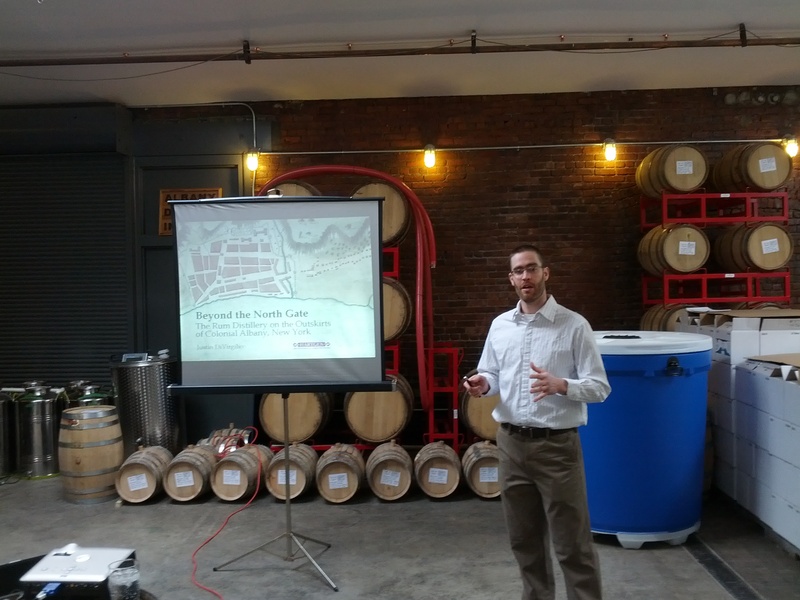 Speaker Justin DiVirgilio gave an amazing presentation on the history of still houses and rum production in the city of Albany. Rum’s history in Albany literally sits on the doorstep of the current Albany Distilling Company, one of the still houses Justin spoke about resided maybe a couple hundred feet from where Matt and John currently distill their products. Matt and John are both well aware of this history, and while both are self-admitted whiskey enthusiasts, they knew from the very beginning that they wanted to produce a rum from their distillery as a homage of respect to the former rum still houses in Albany and the excitement to be the first to distill this city’s first rum since prohibition. Accomplishing this task was no small feat. As I have written about before, Albany Distilling Company operates under the New York State Farm Distillery License, which states that 75% of a product’s ingredients need to be sourced from New York State. Rum, if you do not know, is made from sugar cane and/or molasses and unfortunately there are no sugar cane fields in New York. Matt and John needed to apply for an additional distilling license to be able to produce the rum and source their molasses from the Caribbean as they wanted to follow the recipe of their predecessors. Along with the hurdle of the additional distilling license needed the produce the rum, other rules of the Farmers Distillery License they are also unable to provide samples or sell the rum on their premises at the distillery. 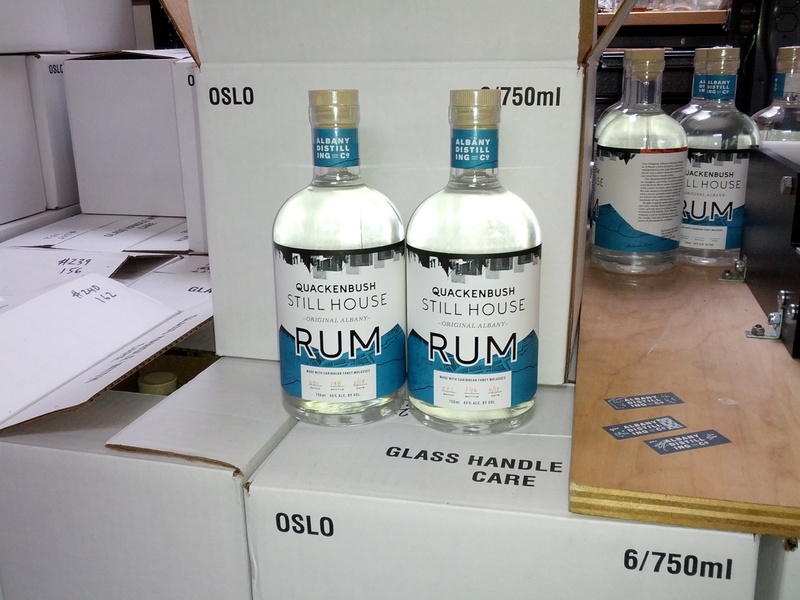 Don’t worry though Quackenbush Still House Rum is very available in both drink and bottle form very close to the distillery and throughout Albany. 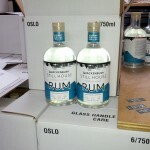 After the presentation and hanging around the distillery a while I set off to get a bottle of the Rum. A quick visit to one of my local liquor stores and I was able to take a bottle home for a taste. My first taste of the rum was a glass with just a little bit of ice added and it was outstanding, I continued to to drink 2 more glasses the same way. This is a flavorful, full, and rich rum. So easy to drink and so tasty each time you take a sip it’s really a great spirit, Matt and John have hit a home run with this rum being their homage to this city’s history with this spirit. I look forward to visiting several of the local bars and seeing what the bartenders have mixed up with this fantastic product now on their shelves there are sure to be some excellent drinks out there as there has been for each of the previous Albany Distilling Company products. As always please feel free to visit the distillery and take a tour – Matt and John are ~almost always~ there and they are just awesome to listen to talk about their distillery, products and processes.